Along with the "loop" form of paternoster, which was used both by men and by women, there was another form, the straight string or linear rosary. This was convenient for hanging from a belt. Most often these linear rosaries appear in portraits of men. 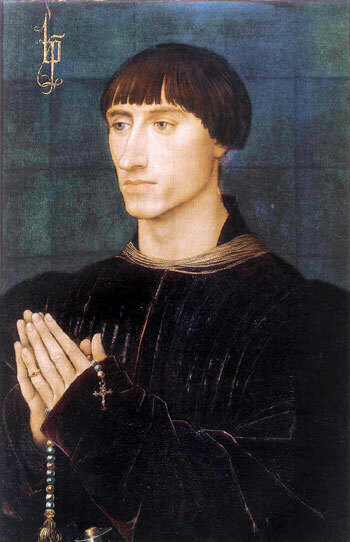 An example is this portrait at right of Philippe de Croy, painted by Rogier Van Der Weyden around 1460. Philippe was of the most distinguished Burgundian nobility, and here we see him posing for an official portrait with his paternoster, which appears to be a string of about twenty beads with a cross at one end and a tassel at the other. These are probably very rich beads, perhaps pearls, though from a painting it's always hard to tell what they're supposed to be. It's surprising how many paintings have rosary or paternoster beads in them, once you start looking. Paintings of St. Jerome in his study often show a simple linear rosary in the background somewhere. 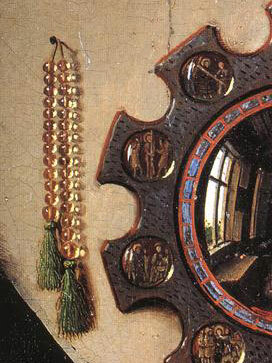 For instance, a portrait of him from the workshop of Jan van Eyck, painted sometime in the 1440s, has a linear rosary hanging from the edge of a shelf. It seems to be about twenty red beads (perhaps coral) with bright green tassels. 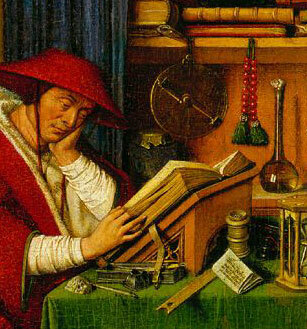 Another example of a linear rosary is from Rogier Van der Weyden's picture "The Magdalen Reading" (see below). The woman sitting on a cushion in front is St. Mary Magdalene, as shown by the prominently displayed alabaster ointment jar. In the background, a man standing behind the Magdalen is holding a linear rosary in his right hand. This is actually only a portion of the original painting; some of the "missing pieces" are in another museum in Lisbon, and from that we can tell that the man with the rosary is actually St. Joseph. 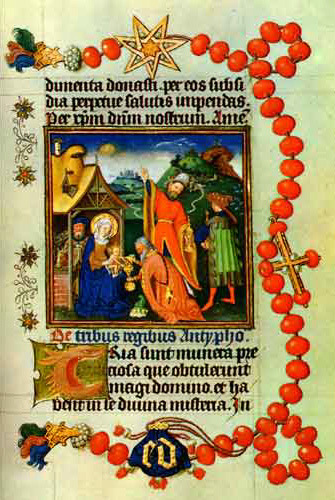 His rosary appears to be about sixteen large beads, perhaps made of amber from their color, and three white beads (bone or ivory, perhaps) all strung on a black cord with heavy tassels. 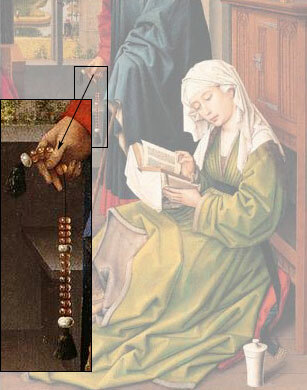 There's another very similar rosary in the background of the well known "Arnolfini marriage" portrait by Jan Van Eyck. The Arnolfini beads are very close in shape to the ones in the Magdalen picture, and they reflect more light, which may mean they're intended to represent glass. These are all quite plausible rosary materials.